We’ve designed this particular wax to achieve reliable results even in cooler climates – with superior container adhesion, resisting shrinkage and frosting. Our Superior CocoSoy A05 has a beautiful and natural creamy soy finish and is formulated to retain a smooth and even surface, the coconut wax component gives it a showroom look. 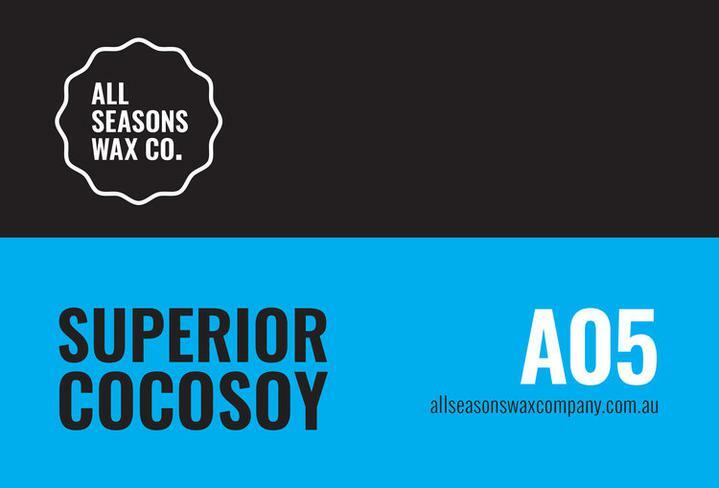 Superior CocoSoy A05 is the result of a 12 month laboratory trialling period where we explored different waxes and hundreds of different blend ratios to achieve a container wax which has outstanding hot and cold scent throw and performs consistently in adverse conditions - as well as the 3 month, interactive testing period where we distributed wax around the world to receive real life feedback. A beautiful, creamy soy finish which remains firm. Recommended Fragrance Load: 8-10% - this depends on the potency of the fragrance so testing is required. Contents: Made up primarily of natural soy bean and blended Coconut wax, the A05 also contains a natural, plant based emulsifier which assists the candle setting smoothly. Please note these figures are a recommendation and not instructions. If you are having difficulties achieving desired results, we recommend testing with different fragrance oils at different temperatures. Superior CocoSoy A05 is perfect for candle makers of all experience levels - it has an amazing creamy soy finish, fantastic wall adhesion resulting in an amazing finished candle. The Superior CocoSoy A05 is relatively easy to work with - and ready to go on any high-end retail shelf. It does have a lower melting point so in Summer, the finished product does tend to become softer.